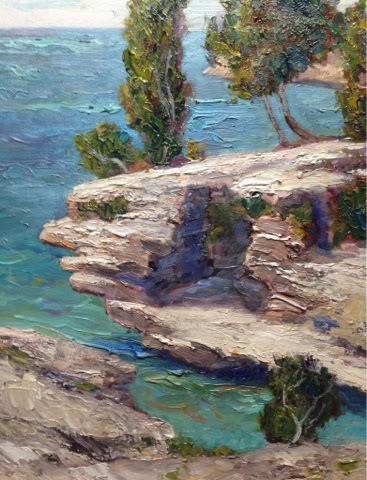 BRAD TEARE: 157 Return to Door County Plein Air Festival! 157 Return to Door County Plein Air Festival! I'm pleased to report that I've been invited to the Door County Plein Air Festival again this year. The accompanying image is a field sketch I painted of Cove Point—a picturesque rock outcropping on the East shore of the peninsula. It's an adequate painting but I feel my outdoor work has improved since 2010. In light of such improvement I'm super excited to once again paint the beautiful landscapes of the peninsula. In the upcoming months I'll be preparing for the event by sharing improved painting techniques I've developed since the last festival. Painting outside is one of the most daunting tasks any painter can attempt. I hope my ideas will be helpful. Congrats on the invitation, Brad, and good luck. that's a beautiful painting and a very good design. very enjoyable. Thanks, Robert! It should be fun.